As an adult I taught in public schools in gifted programs and developed curriculum for gifted learners. 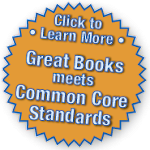 Great Books was a staple of the curriculum for gifted readers in the systems in which I taught, so I never had to go to bat for it. I was grateful for the materials and respect that the program had in those systems among administrators and teachers of the gifted. I always felt that the program should have been used for all students—to teach critical thinking, introduce readers to authentic literature, and help them read for comprehension. My gifted students loved labeling questions. They would joyfully call out, "Literal—right there, in the text!" or "Evaluative—needs my experience or opinion!" and most importantly, once they had a label and some experience they could easily identify good interpretive questions on their own and lead discussion groups. I was a stickler for keeping to interpretive questions in our discussions, and students knew this. This was my goal in the classroom. I wanted my students to be able not only to participate in Shared Inquiry, but to lead their peers in a meaningful analysis of a text. This would only be possible if students had verbal "handles" for their thought processes, so we spent an enormous amount of time at the start focusing on the process as well as the literature. As much current research on learning and the brain has shown, language scaffolds learning and thought. I believe that the language of Shared Inquiry gives students strategies and a framework for discussing and analyzing a text with others. It also gives them labels for their text-related thought processes and, thus, metacognitive tools for reflecting on how they approach and comprehend what they read. Several years ago, I moved back to Atlanta after forty years in another city. I began to attend my mother's Great Books group meetings at the Buckhead Ida Williams library. They have a strong group with a core of about eleven readers and an additional six to eight who weave in and out of the group throughout the year. The group is primarily female and at least half of them are in their eighties. This is my first time participating in an adult Great Books group, and it has been delightful. Discussions are lively and pertinent and reflect the enormous intellect and experience of the readers. This group, for instance, has often reread an entire series of books a decade after first reading and discussing it, bringing new interpretations and experience to the table. Lee Pilgrim taught in public schools in Georgia at the elementary and middle school level in the regular and gifted resource classroom. Her experience includes assessment and evaluation for placement, program coordination, and curriculum writing for gifted programs. She has worked with the Future Problem Solving Program (FPSPI) at the state and international level for more than fifteen years as an evaluator, program director, and trainer.